For years, I have battled with the lightweight packing peanuts and Styrofoam chips used as filler in the bottom of large pots on condominium terrace gardens. Weight restrictions often limit how much soil can go in containers on rooftop/terrace gardens – but there were no good commercial, gardening-specific alternative to these lightweight materials. And it goes without saying that the biodegradable corn-based, eco-packing peanuts are completely unsuited to wet use in a pot! Yet in addition to being toxic, regular peanuts are notoriously difficult to handle, blowing around on breezy rooftops and being hard to corral when wet. Plus, they become impossible to clean for reuse or recycling. Once dirty from gardening, they must be thrown in the landfill. The re-use ends there. I particularly balked at the idea of growing food in pots full of these junky, sometimes toxic materials. So it was a happy day when I met entrepreneur Joanna Guzzetta, President of Portland-based Four Seasons Container Gardens and creator of Packing Pearls – a product that could make my container garden projects a good deal easier – and more environmentally friendly. *air-permeable, heavy-duty fabric liner that separates plant roots and soil from the packing pearls below and can be cut to fit. Invented here in Portland, Oregon by a professional gardener and made and assembled in the US, Packing Pearls are composed of 1/3 recycled material. They are recyclable (can be formed into new products) – and reusable (because they do not themselves break down). Because they do not break down, it is important to save and reuse them indefinitely. Did I mention that they are round – and definitely cleanable? 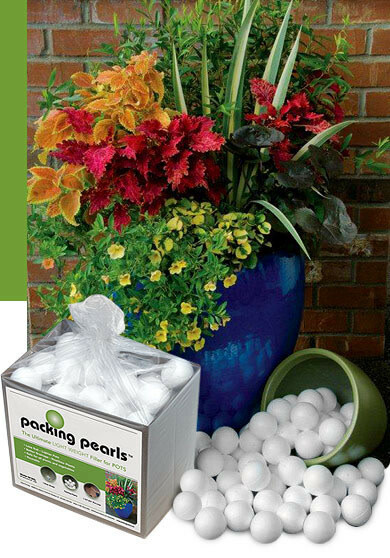 According to the company literature, Packing Pearls’ 3-part system creates a good drainage system in the pot by keeping the soil contained and separate from the pearls, by allowing air and water to move through the spaces between the pearls, and by keeping the drainage holes clear. In addition to establishing good drainage in pots, the Packing Pearls system minimizes potting soil use, is simple to assemble and disassemble, and is made of non-toxic products. They are also a great solution to square or unusually shaped containers and troughs, since the pearls and fabric liner can be custom-fitted. These are good reasons to try it, even if weight isn’t an issue for your containers. Packing Pearls starter kits come in two sizes: small/medium (for pots up to 16" wide), including 1 drain shield, 1 piece 18×18″ pot liner, and 50 pearls, $19.99) and medium/large (for pots up to 22" wide including 1 drain shield, 1 piece 24×24″ pot liner and 80 pearls, $29.99). Parts can be purchased separately as well. Joanna came by my home office earlier today to explain the system and left me a sample to try in a large planter. I guess this is one of the perks of my job, huh? Stay tuned – at some point in late spring, I’ll report back. I’m also testing out a system called Ups-A-Daisy planter inserts. I got a sample pack of these from Kianga, Inc., a company in Illinois, and set them up in five small to medium planters last fall. As with the Packing Pearls, the Ups-A-Daisy products reduce the amount of soil you need to add to a pot – especially useful when you’re creating temporary/seasonal plantings, which don’t usually need as much soil as they’re in anyway. By minimizing the possibility of excess soil sitting below the plants’ roots in a container, they can minimize the likelihood of root rot. They also reduce planter weight, and eliminate the need for toxic or aggravating chips, peanuts, used water bottles, rocks, or other detritus. They can be re-used year after year. The Ups-A-Daisies were drop-dead simple to install – I just lowered them into the pot, right way up, and added potting soil. I did use a cut piece of landscape fabric over the center hole to prevent soil crumbling through it, although the company says this is not necessary. Of course, being round, they only work in round pots with a wide enough top opening to accommodate the disk. They have a good drainage system comprised of a center hole and many smaller holes in the indented groove running around the edge. So far, I have appreciated the ease of installation and I certainly used less potting soil in the containers. I’ll know more when I take the winter planters apart in May to install the summer plantings. Ups-A-Daisy Pot Inserts range from 10-18 inches in diameter, running from $4.99 for the 10" disk to $12.99 for the 18" disk. Both companies are relatively new but their products can be found in some local garden shops including Cornell Farms Nursery on SW Barnes Road – and, of course, may be ordered directly.